This is a book which ought to be read widely as we remember in June 2017 the 50th anniversary of the Six Day War of 1967. If we wonder why Israel shows no sign of being willing to end its occupation of the West Bank and East Jerusalem, Avi Raz, an Israeli Jewish journalist and historian, has collected convincing evidence from the period of twenty-one months between June 1967 and February 1969 to show that the vast majority of Israeli leaders never had any intention of withdrawing from the occupied territories. Israeli policy was pursued by deliberately refusing to formulate its peace terms, annexing Arab Jerusalem ‘under the pretence of “municipal unification”’ (knowing that is contravened international law), pursuing a policy of Judaizing Arab Jerusalem, and approving the building of new settlements – all with the intention of creating facts on the ground. ‘Messianic ardor’ after the ’67 conquests. ‘The Israeli public were overcome by the intoxication of national pride, military arrogance, and fantasies of the glory of messianic deliverance’ (Yeshayahu Leibowitz). ‘We said openly that the map will never again look as it did on 4 June 1967 … I am not exaggerating when I say that for us it [the prewar map] has something of the memory of Auschwitz (Abba Eban). The ‘demographic danger’ from Arabs eventually outnumbering Jews and Israel ceasing to be a Jewish state with a Jewish majority. Israel’s policies regarding the West Bank and Gaza were intended to encourage as many Palestinians as possible to leave and not allow refugees to return. Israel’s approach to King Hussein was to force him to the negotiating table without revealing its own terms, to send diversionary messages, and to make offers which they knew he could not accept. By the summer of 1968 Israel had developed a plan to create an Arab civil administration in the West Bank devoid of power and run by local collaborators. ‘The Israeli search for Palestinian quislings was just one episode in what became a broader and complex effort to maintain the territorial status quo created by the military victory in the Six Day War. This effort, which involved King Hussein of Jordan as well as the West Bank political elite who were alike eager to reach a peaceful settlement with Israel, was mainly directed at the United States and amounted to a consistent policy of prevarication. Its aim was to mislead the Americans into thinking that Israel was seriously trying to revolve the Arab-Israeli conflict. Prime Minister Eshkol (who was Prime Minister during this period of twenty-one months until his death in February 1969 and was considered a ‘moderate’) was succeeded by Golda Meir, whose approach was more uncompromising. But their attitudes to the Palestinians were very similar. ‘There was no such thing as Palestinians … It was not as though there was a Palestinian people in Palestine considering itself as a Palestinian people and we came and threw them out and took their country away from them. They did not exist’ (Golda Meir). ‘What are Palestinians? When I came here there were 250,000 non-Jews – mainly Arabs and Bedouins. It was desert – more than underdeveloped. Nothing. It was only after we made the desert bloom and populated it that they became interested in taking it from us’ (Levi Eshkol). Israeli policy after June 1967 made it difficult for the Palestinians to develop coherent leadership or policy. Israel’s refusal for 50 years to end the occupation is simply a continuation of the policies that were adopted in the period immediately after the Six Day War. The withdrawal from Gaza ordered by Sharon on 2005, far from being a generous gesture towards the Palestinians, was intended to consolidate Israel’s occupation of the West Bank. Israel has never even discussed the Arab peace offer of 2002. Israel has consistently lacked the will to make peace. Abba Eban quipped that the Arabs ‘never missed an opportunity to miss an opportunity.’ But the evidence suggests that it was Israel which consistently missed every opportunity to make peace after 1967. In 2017, 50 years after the occupation began, we have to deal with the situation as it is today – not what it was in the past. 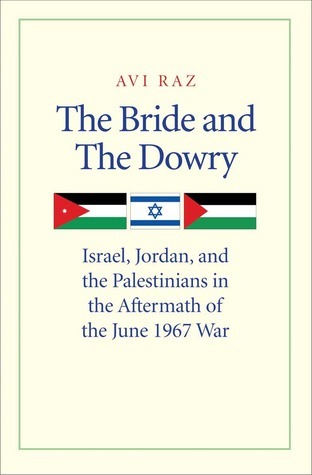 But Avi Raz’s history of the 21 months immediately after the June 1967 War may help us to understand how we have got ourselves into this situation. This entry was posted in Human Rights, Israel, Middle East, Palestine on March 30, 2018 by Stephen Sizer.